Many of my non-IT friends ask me about websites and how to make a website. Usually, when they search online to find the basics, most of the resources talk about the fundamentals like domain name, hosting and platforms, which is a good thing. Fundamentals are important. However, around 80% of those resources go in deep details like types of hosting etc. which are not only unnecessary but confusing for a beginner. I mean, why a beginner would want to know about shared hosting, VPS or something which is not relevant to them? So, I have tried my best to keep things as simple and straightforward as possible. However, if you still would have some questions, feel free to contact me. Domain name is sometimes called only “domain” too. So don’t be confuse about it; domain name and domain are same the thing. The domain name refers to www.Google.com. This is the domain name of Google – simple. In order to make other concepts easier, consider domain name your shop address. Now, if you want to create a website, first you need to select a name. But you cannot take www.Facebook.com as your domain name because it is already taken. Just like two different houses in the world can’t have the exact same address. You can buy domain names from popular sellers like GoDaddy, HostGator or thousands of other sellers. Usually they sell for around $10 per year but the prices may vary. When you would go to these websites to buy a domain name, which is not actually buying but renting as we are paying yearly fee, you would get few options. Let’s talk about them. Always prefer .com domain name. You might get other domains like .net and .info for a much lesser price but .com domain name looks professional. You can rent the domain name for 1, 2 or 3 years – depending on the selling company but if you forget to renew it after that time, the company would send you a notification about your due payment. If the user fails to make the payment on time, the company can sell it to someone else and you would lose the ownership. Web hosting is sometimes called “hosting” too and both of these terms refer to the same thing. You have bought an address for your shop, now you need a plot to build the shop. Web hosting provides that plot or storage space so we can build our website on it. You can buy web hosting with limited storage like 100GB but most of the people prefer unlimited storage because the price difference between both options is not that big. Still, 100GB for a website is too much. Web hosting sells for almost $4 per month that would be $48 per year. Let’s talk about different options you would see there. Storage refers to the overall space you would get. It is better to prefer unlimited storage. Domains refer to how many domain you can use there. That’s the most interesting part. A single domain means you can build only one shop on that land. The other option is “unlimited” that comes with a slightly higher price tag. Unlimited domain names mean you can buy as many domain names as you want and build your website on the same hosting. It is like building multiple shops on a piece of land. And don’t forget, you have unlimited land. Bandwidth refers to the traffic allowed to/from your website in a given month. Traffic means the data being downloaded or uploaded to/from your website. Always prefer an unlimited option. In order to understand the concept of bandwidth, think about the mobile data plan. You pay a fix amount to the network and get a fix amount of data (for example 10GB) that you can use within a month. There might be some other options too but these are the most important ones that you need to understand. Almost all domain name sellers also sell web hosting but there are no limitations and you can buy these from different sellers (from wherever you get a good deal). For almost $60, you can get a domain name and web hosting for one year, and do your experiments on it. However, professionals buy web hosting and domain names for many years at once because it comes cheaper and they don’t have to renew it every year. Now you have the address and you have a land, it is time to build a shop. Just like building a shop, building a website has many different ways. You can use platforms like WordPress, Joomla or many others. Each one of them has its own pros and cons, and we’d discuss them in the future. Some of you would be thinking that we have bought domain name from a different seller than the web hosting. How these two would be associated with each other. Actually this is done by simply pointing the domain name to the web hosting. 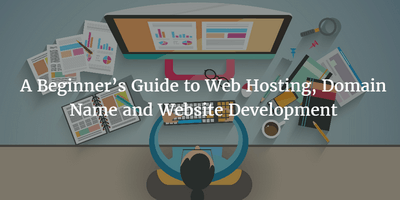 Whether you buy web hosting and domain name from the same seller or different ones, you would have to associate the domain name with its hosting when starting website development.